Wondering where the Yellow Running Man had gone? He just got back from a long vacation! We've been listening to your feedback and we've rethought our app to provide a cleaner, richer experience that is designed for the latest Android devices. We're always happy to hear from you so please reach out to us at aim.support@aim.com to let us know how we can make the app even better! AIM is the best way to keep in touch with people and groups, no matter where they are. 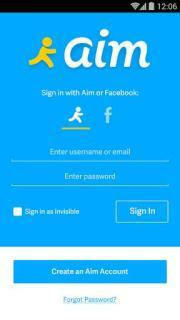 With AIM, you can chat with friends on AIM, Facebook and Google Talk. You can also start or join a group chat, share images and your location, and continue conversations with your desktop and web clients seamlessly. Thank you for your feedback! Please continue to report issues by reaching us at aim.support@aim.com.